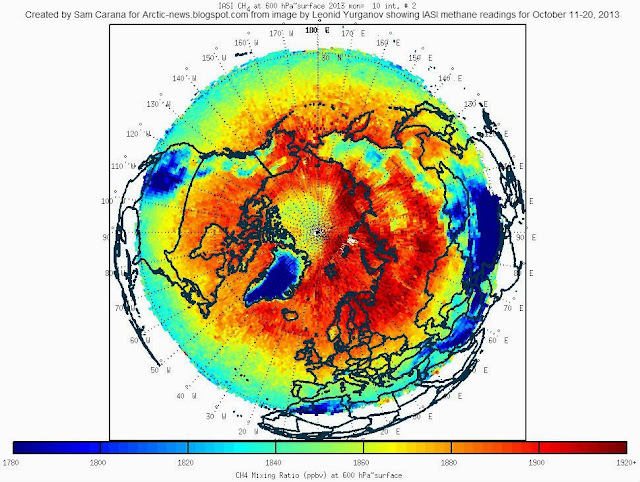 Methane levels in the atmosphere over the Arctic Ocean are very high, as illustrated by the image below, by Leonid Yurganov, showing IASI methane readings for October 11-20, 2013. Previous posts have discussed these high levels of methane, pointing at links between high methane levels over Arctic Ocean and earthquakes and volcanic activity. Malcolm Light points at another factor that is contributing to the high methane levels observed over the Arctic Ocean in October 2013. Malcolm says: The massive methane release in the Arctic this October is partly because the Gulf Stream waters got massive heating in the Atlantic off the North American coast in July. It takes the Gulf Stream currents almost 4 months to reach the emission sites along the southern side and end of the Eurasian Basin. 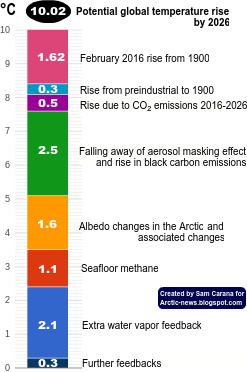 This combined with the earthquake activity along the Gakkel Ridge and deep pyroclastic eruptions is escalating the rate of methane release by destabilizing the submarine Arctic methane hydrates at increasing rates. The NOAA image below shows temperature anomalies for July 2013. NOAA adds that in July 2013 many regions were much warmer than average, with part of the northeastern Atlantic off the coast of North America observing record warmth. 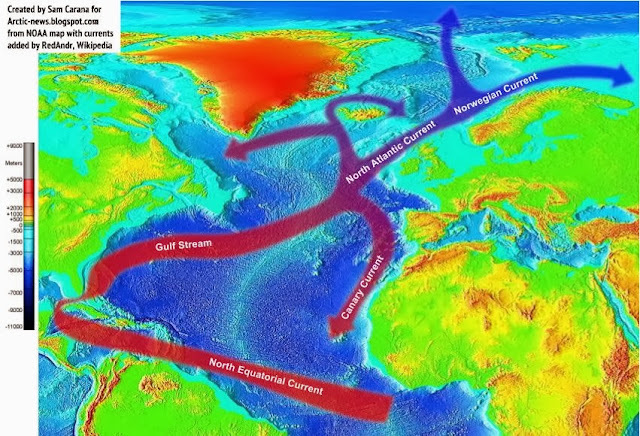 The image below shows how water traveling along the Gulf Stream ends up in the Arctic Ocean. Water in the Gulf Stream travels at 4 miles per hour, but slows down to less than 1 mile per hour in the North-Atlantic Current. 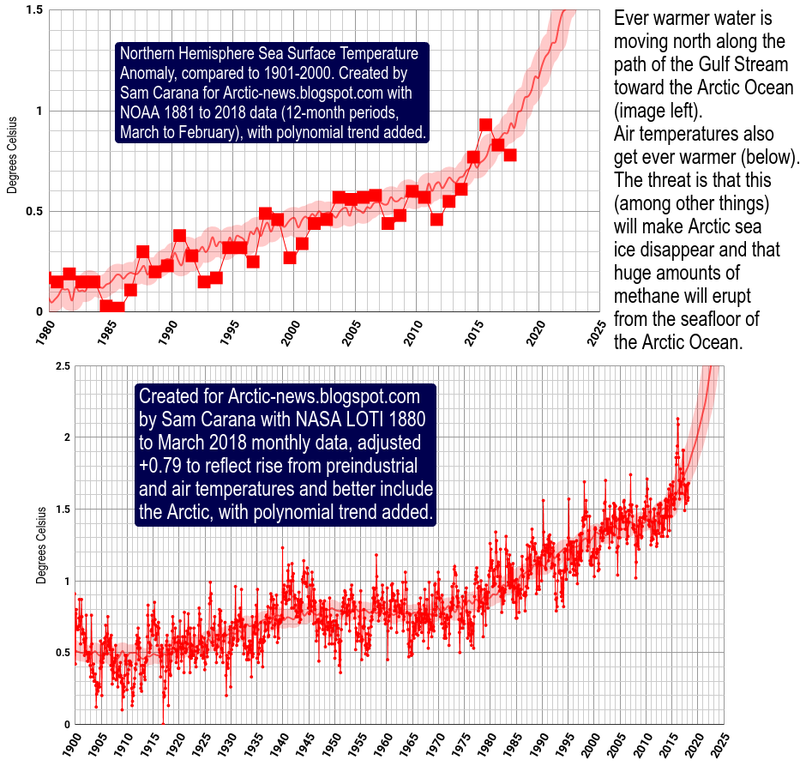 This means that water warmed up off Florida in July will start reaching waters beyond Svalbard in October. The image below, from Malcolm Light's September 2012 post Further Confirmation of a Probable Arctic Sea Ice Loss by Late 2015, shows how warm water flows into the Arctic Ocean and warms up methane hydrates and free gas held in sediments under the Arctic Ocean. 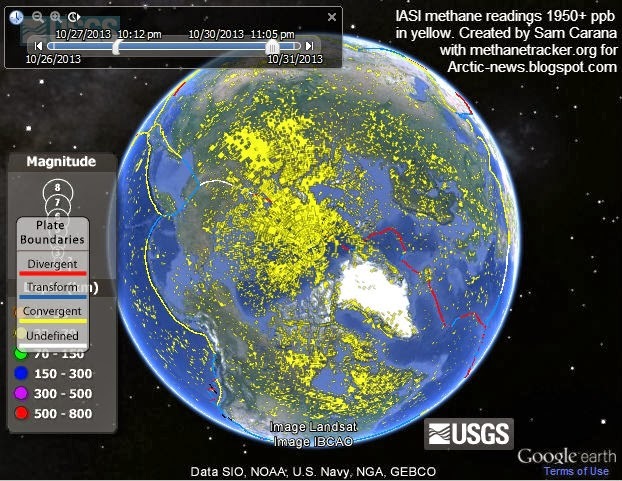 The image below shows the methane readings over the past few days on the Northern Hemisphere. Captain Kirk, there is trouble on sensor screen and Spock has been aware of it - emotionally. Microbial activity creating methane and carbon dioxide release on land of type M planet ahead is from warmed tundra in both dry and wet conditions now and is going up at same time heat pulse is getting to methane hydrate stability zone on sea floor there -Size and importance of the little guys, the bacteria isn't fully appreciated or that methane sequestered in sea floor is so large that clouds of it released so far are puny by comparison, Perhaps an all out effort could still be made which could perhaps corral human effort to the purpose of restoring Earth's open systems and to help bacteria stop methane; stop its release. Maybe the mega corporation Monsanto for instance can be turned towards goal of trying to restore Earth's open systems of Nature Large and biodiversity necessary for their keeping HZ. This could be done by expertise of quality management designed to maximize rate of trying to actually accomplish keeping Earth alive. -While at same time making it so the whole background bias of world finance on whole acts like a living open system large itself hell bent on keeping Earth alive and leaving not one person stranded. Not one little creature of Nature without protection to the absolute greatest degree. This switch to open system of economics worldwide would link up a sustainable symbiotic life form..
Technologic rotation of advance would rotate into firing order and expansion could go exponential. Don't hold your breath waiting for this Dale. There is a runaway train coming down the tracks through the tunnel and no way out!